Bonfring Campus Ambassador Program recognizes the individuals with entrepreneurship, enthusiastic, hard working, leadership and motivational skills by providing them the opportunity to represent Bonfring on their campus. Campus Ambassador Program provides an opportunity for the students to build up their skills on leadership and entrepreneurship under the exceptional guidance of our experts. 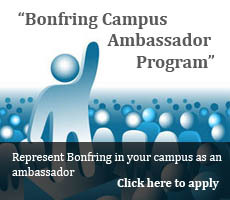 Campus Ambassador will act as a liaison between Bonfring and their college/university. Help students of your campus to learn the latest advancements and technologies by planning and organizing various Workshops/Events of Bonfring. Creates awareness of Bonfring in and around your campus and motivate students of your neighboring college/university to join Bonfring. Create excitement in students for different events planned in the campus. Help build partnership with your college/university. Will learn and develop communication, management and leadership skills. Interaction with new people from your campus and with the ambassadors of various campus. Bonfring's	Campus Ambassador Certificate and incentives after successful completion of program. Good communication skills and leadership qualities. Should always be active as an Ambassador. Passion for learning, creativity, innovation and information sharing. Interest in teaching people and organizing events.